Read through to know more about Intertops Poker and their lucrative bonuses and promotional offers. We give you an access to the latest offers from Intertops Poker! Intertops came into the online gambling and betting scene with the launch of their Sportsbook back then in 1996. After that Intertops started its other products such as casino and poker. So, its been 22 years since Intertops came online and it has tasted success and continues to be the trustworthy online gambling site for sports betting, poker and casino. Also, Intertops is available with all their products on a player's mobile device as well as their desktop device. Talking about Intertops Poker, then one can say that this online poker site is on its path of becoming a huge success just like its other gambling sites of casino and sportsbook. Players can sign up here for free and grab their awesome bonuses such as No Deposit Bonus redeemable for a set of Gold Chips, a whooping Poker Welcome Bonus of 200% up to $1,000 and lots more. Also, collect your Frequent Player Points (FPPs) by playing for real money at the poker tables. Intertops Poker has a full – fledged Poker Rooms set having games like Texas Hold'em, Omaha Hi/Lo and their variants. Players can participate in the promising poker tournaments and play at these widely renowned poker tables and win bumper prizes in return. Real money customers can join the stunning poker tournaments and freerolls organized daily, weekly and annually and win huge amounts. Players can also play in the Intertops Satellites and strike a chance to win a guaranteed seat at the Turbo series and Sundowners tourneys. Intertops is a trusted platform which sponsors products such as sportsbook, poker and casino. This gambling site is incorporated and licensed in Curacao, Netherlands Antilles which makes Intertops a safe and trusted site to play and wager at. Another security safeguard which protects real money transactions done by a player is the SSL browser encryption done by Intertops. All the credit card payments and withdrawals are processed in the highly secured 128bit encryption technology. Thus, players can safely wager at the real money poker tables at Intertops. Celebrate the joy of playing poker with the newly launched instant play Intertops mobile app. No download is required to play at Intertops Poker. Their mobile app is available on player's Android mobile or iOS, tablet, Mac etc. Intertops Poker mobile app comes with the instant play option and provides for an ultimate gaming experience on its exciting and thrilling poker tables. Players can collect their Frequent Player Points (FPPs) by wagering real money at the poker tables. The mobile app of Intertops Poker is fully loaded with some stunning features so that the mobile players can have a gala time. So, go ahead and sign up at Intertops Poker via your mobile devices and be a part of the weekly FPP Race, collect your Gold Chips and redeem them for a No Deposit Bonus of your choice. for an ultimate gaming experience on its exciting and thrilling poker tables. Players can collect their Frequent Player Points (FPPs) by wagering real money at the poker tables. The mobile app of Intertops Poker is fully loaded with some stunning features so that the mobile players can have a gala time. So, go ahead and sign up at Intertops Poker via your mobile devices and be a part of the weekly FPP Race, collect your Gold Chips and redeem them for a No Deposit Bonus of your choice. Here at Intertops Poker, players can participate to play the live poker tournaments. This will give them a chance to explore some of the spectacular locations across the world plus winning some smashing real money prizes by playing in the Intertops Poker Tournaments. This poker platform sponsors some of the finest and luxurious poker tournaments where real money customers can sit together and play their favorite poker games. For all the poker lovers around the world, there are special poker tournament series organized by Intertops Poker. You will have Freeroll tournament series, special events tournament series, Megastack Freeroll series and lots of other live tournaments where you can win whooping amounts of real money. explore some of the spectacular locations across the world plus winning some smashing real money prizes by playing in the Intertops Poker Tournaments. This poker platform sponsors some of the finest and luxurious poker tournaments where real money customers can sit together and play their favorite poker games. For all the poker lovers around the world, there are special poker tournament series organized by Intertops Poker. You will have Freeroll tournament series, special events tournament series, Megastack Freeroll series and lots of other live tournaments where you can win whooping amounts of real money. Intertops Poker has their own well – built software with a smooth running technology. Real money customers can either 'Download' the Intertops Poker software on to their game play devices or can kick start playing instantly by hitting at the 'Instant Play' button. The software installation might take a few minutes. After the downloading and installation of the Intertops Poker software is done, players then just need to sign up and the stage is set to start off playing at the real money poker tables of Texas Hold'em, Omaha Hi/Lo etc. The gaming technology is quite efficient and the real money players can have a lot of fun while playing at the Intertops Poker tables. the Intertops Poker software on to their game play devices or can kick start playing instantly by hitting at the 'Instant Play' button. The software installation might take a few minutes. After the downloading and installation of the Intertops Poker software is done, players then just need to sign up and the stage is set to start off playing at the real money poker tables of Texas Hold'em, Omaha Hi/Lo etc. The gaming technology is quite efficient and the real money players can have a lot of fun while playing at the Intertops Poker tables. Know the basic concepts of Poker and start playing for real money on your favorite poker games here at Intertops. At Intertops Poker, real money customers will find a proper guide section which includes rules of every game, hand rankings and poker playing strategies that a player can use in their game play. Texas Hold'em is the most popular poker table among poker lovers. At Intertops, it is available in pot limit and no limit action. Here, you will find ring tables running all the time plus thousands of weekly tournaments. Also, Texas Hold'em is usually played at Intertops Poker when the winner of WSOP (an annual series) is announced. Omaha High is a very famous variant of poker, specially in pot limit action, it is world famous. At Intertops Poker, players will find Omaha Poker both in limit and pot limit. These Omaha variants are available for players from all around the world. Another variant of Omaha, is Hi/Lo Poker which is available at Intertops in limit, pot limit and no limit action. Players can check the Poker Hand Ranks information at Intertops before playing poker for real money. 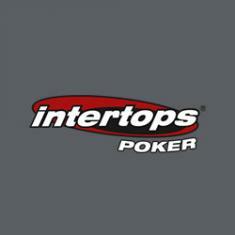 Intertops Poker hosts numerous tournaments with some guaranteed prizes in return for playing at the real money tables. Sign up now at Intertops Poker and take part in the poker tournaments. Grab the opportunity to visit beautiful locales along with getting rewarded with some exclusive prizes. At Intertops, players can play in the Poker Freerolls Tournament. Currently, Intertops Poker has four Freerolls every day, from Monday to Friday for 6 hours. Players will win tournament tickets, $25 guaranteed prize money for top 3 players. You will also get 3 extra freerolls from Monday – Friday and it is here where the players can play to grab a share of $100 GTD. Two Freeroll tournaments will be held every weekend with $50 prize money for top 5 players along with tournament tickets. Buy your tickets for the IntertopsPoker Caribbean Tournament and get a big opportunity to win a St. Maarten package worth $250,000 GTD + one double room booked at the Sonesta Maho Beach Resort from 28th of March to 2nd of April, 2019. March 29th, 2019 is the day when the players can take their seats at the $250,000 GTD WSOPC Caribbean and play for real money to bag the 1st prize. Accomplishing the Caribbean Satellites will help the player to take a seat at the main WSOPC event. Send an e – mail to the Intertops Poker Support staff. Also send your Username or poker nickname in the mail. The players signing up at Intertops Poker can head straight to the 'Cashier' section to make their first deposit and bag their whooping Sign Up Bonus Offer. But before making your first deposit of minimum $25, remember to redeem the Bonus Code '1000ITP'. This will fetch you a 200% up to $1,000. This New Player Bonus will be paid in increments of $5 when the player completes the Frequent Player Points demands (FPPs). 83.335 FPPs are required to get an increment of $5. The registered players at Intertops Poker can grab their Reload Bonus offer by logging into their real money accounts. After that, head to the 'Cashier' section, to select your deposit payment method. Make your deposit by hitting the 'Reload Bonus Code' button. Fill in the eligible Bonus Promo Code and click on 'Redeem Bonus'. This will credit your Reload Bonus into your account and real money can view their bonus details by going to the 'My Account' section. The Basics: The lower levels shall start with one and gradually the player will progress to higher levels. Completing all the loyalty tiers in a level will upgrade you to the next level. Don't fall under 11 FPPs and you'll never lose a particular level. Turbo Tiers: Intertops Poker will reward the players when they'll complete a tier. The faster a player reaches a Loyalty Tier, more the rewards they will get with Turbo and Super Turbo Bonuses. Intertops Poker gives a whooping rakeback of 36% to its real money players. This is a daily basis rakeback which will be awarded on ring game rake and tournament fees in increments of $10. Players wanting to receive rakeback can e – mail the Intertops Poker Support staff. The support staff will verify your details and playing activity and then credit you the rakeback accordingly. Please enter your review for the Intertops Poker.